For those of you who are making the jump to Windows 7 from Windows XP, you will find that there are quite a few changes. One of the biggest annoyances I hear people complain about is the fact the toolbar menu on Windows Explorer has disappeared. How to add the Menu back on to Windows Explorer in Window 7. 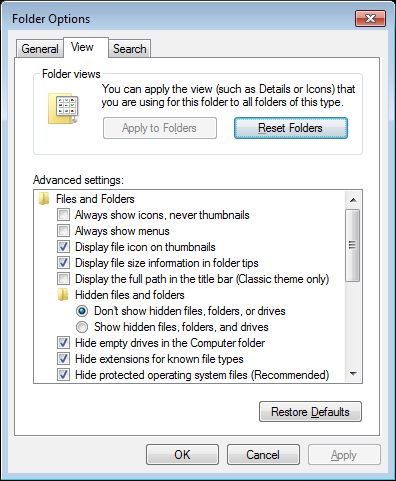 Under the Advanced Settings section on the View tab in the Folder Options dialog box, look for the tick box called Always show menus under the Files and Folders title. Then click on the Apply button to save the changes. Now, whenever you open Windows Explorer, you will see the menu in the top toolbar.